Return of the #ELLEdTech Twitter Chat! 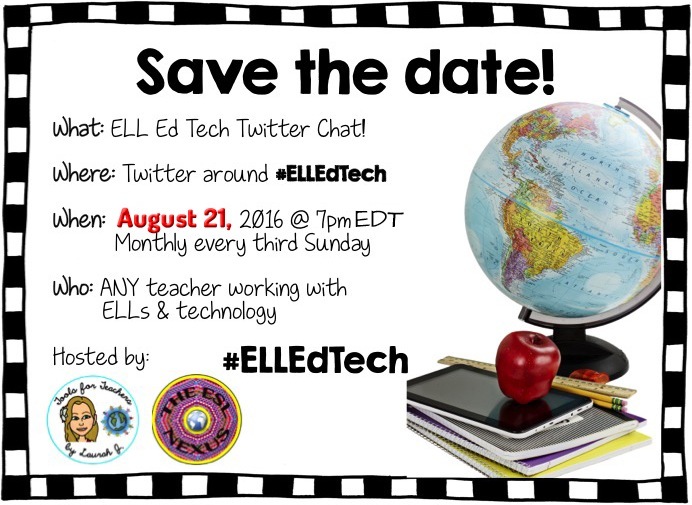 The #ELLEdTech Twitter chat is back this Sunday, August 21st! Please join co-host Laurah from Tools for Teachers by Laurah J and me at 7:00pm Eastern, 4:00pm Pacific time as we discuss Tools for Helping Teachers Learn More about Working with ELLs. Details are below. 1. Log into Twitter on Sunday; the chat runs from 7:00 - 7:45pm Eastern. 3. The first five minutes will be spent introducing ourselves. 4. Starting at 7:05 @ESOL_Odyssey or @The_ESL_Nexus will post questions every 8 minutes using Q1, Q2, Q3, etc. to identify the questions and the hashtag #ELLEdTech. 5. Answer the questions by prefacing them with A1, A2, A3, etc. and use the hashtag #ELLEdTech. 6. Follow any teachers who respond and are also using #ELLEdTech. 7. Like (click the heart icon) and post responses to other teachers' tweets. You can schedule your answers to the questions in advance by using an online scheduler such as TweetDeck or HootSuite (and remember to use A1, A2, etc. and #ELLEdTech). Links are encouraged, but use tinyurl, bitly, goo.gl or ow.ly to shorten your link so it can be included in your tweet. Just click one of those links, paste the longer link in the app's box to shorten it for Twitter, then paste the shortened link into your tweet. If you have relevant images, we encourage you to post them, too. 1. Please stay on topic. 2. Please do not post about paid products unless explicitly asked. 3. If you arrive after the chat has started, please try to read the previous tweets before joining in. 4. Feel free to just read, like, and/or retweet if you prefer -- we know the first time can be a little overwhelming! 5. Always use the hashtag #ELLEdTech when tweeting. You are welcome to let any of your teacher friends who might be interested in joining us as well know about it. We look forward to chatting with you on Sunday evening!